The fight was held at Stanley Civic Hall in front of 500 fans, and by the time Ettridge entered the cage they had already been treated more than 11 bouts. Ettridge began cautiously and looked to find his rhythm, however he soon relaxed and landed some excellent kicks and punches. His confidence increasing he let an excellent punch combination followed by a knee which landed perfectly. This changed the momentum of the fight and he continued to attack with ferocity. Seeing an opportunity he locked onto Fahey and took him down finishing the fight with a front choke. 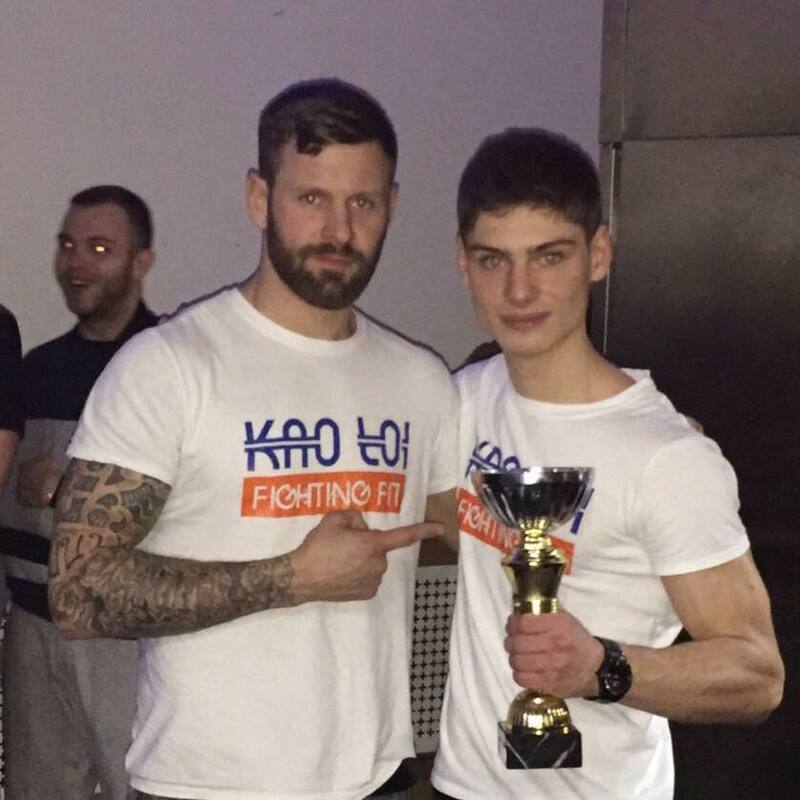 Kristoffer Addis and Oskar Stachura who train at the Kao Loi Gym on Skipton Road, fought in Clermont Ferrand in the Perfect Muay Thai show run by trainer and promoter Marcel Do Nascimento. It was to be Stachura’s first international fight since joining Kao Loi Gym two years ago, while for Addis it was the final fight in a terrific career spanning 10 years. His final challenge was against World Champion Sebastian Laplanne from the Djai Muay Thai club in Toulon, a veteran of 40 fights. Stachura has had five fights in total and was matched against local fighter Cedric Ferrandon who was in his 14th. This made the local man clear favourite going into the match, however a serious nose injury after a sustained powerful attack by Stachura saw the first doctor’s intervention. Although the fight resumed it was over shortly afterwards following an accurate left punch. “This was my first fight under full rules and this win has given me much more confidence. I feel like I have overcome a massive challenge today” said Stachura after his victory. Addis versus Laplanne was the main event and the betting was even with no clear favourite. However it was the Toulonnaise who proved to be the fitter man wearing down the Harrogate fighter with consistent combinations.